A newly published study provides the first clear-cut evidence that supernova remnants accelerate cosmic rays to incredible speeds. A new study using observations from NASA’s Fermi Gamma-ray Space Telescope reveals the first clear-cut evidence the expanding debris of exploded stars produces some of the fastest-moving matter in the universe. This discovery is a major step toward understanding the origin of cosmic rays, one of Fermi’s primary mission goals. Cosmic rays are subatomic particles that move through space at almost the speed of light. About 90 percent of them are protons, with the remainder consisting of electrons and atomic nuclei. In their journey across the galaxy, the electrically charged particles are deflected by magnetic fields. This scrambles their paths and makes it impossible to trace their origins directly. Through a variety of mechanisms, these speedy particles can lead to the emission of gamma rays, the most powerful form of light and a signal that travels to us directly from its sources. Since its launch in 2008, Fermi’s Large Area Telescope (LAT) has mapped million- to billion-electron-volt (MeV to GeV) gamma-rays from supernova remnants. For comparison, the energy of visible light is between 2 and 3 electron volts. 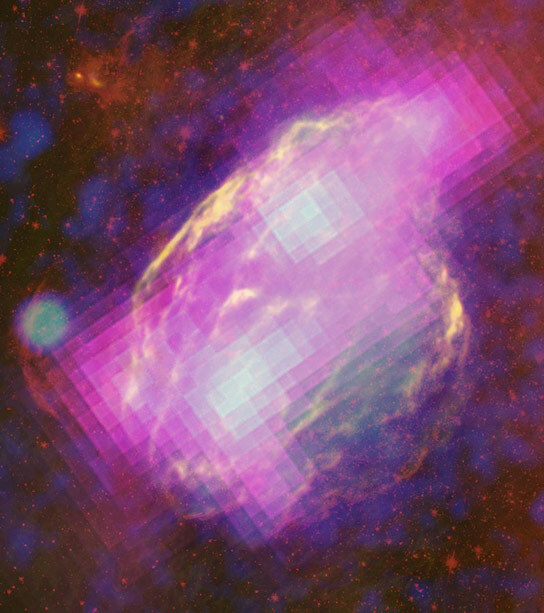 The Fermi results concern two particular supernova remnants, known as IC 443 and W44, which scientists studied to prove supernova remnants produce cosmic rays. IC 443 and W44 are expanding into cold, dense clouds of interstellar gas. These clouds emit gamma rays when struck by high-speed particles escaping the remnants. Scientists previously could not determine which atomic particles are responsible for emissions from the interstellar gas clouds because cosmic ray protons and electrons give rise to gamma rays with similar energies. After analyzing four years of data, Fermi scientists see a distinguishable feature in the gamma-ray emission of both remnants. The feature is caused by a short-lived particle called a neutral pion, which is produced when cosmic ray protons smash into normal protons. The pion quickly decays into a pair of gamma rays, emission that exhibits a swift and characteristic decline at lower energies. The low-end cutoff acts as a fingerprint, providing clear proof that the culprits in IC 443 and W44 are protons. The findings will appear in Friday’s issue of the journal Science. In 1949, the Fermi telescope’s namesake, physicist Enrico Fermi, suggested the highest-energy cosmic rays were accelerated in the magnetic fields of interstellar gas clouds. In the decades that followed, astronomers showed supernova remnants were the galaxy’s best candidate sites for this process. A charged particle trapped in a supernova remnant’s magnetic field moves randomly throughout the field and occasionally crosses through the explosion’s leading shock wave. Each round trip through the shock ramps up the particle’s speed by about 1 percent. After many crossings, the particle obtains enough energy to break free and escape into the galaxy as a newborn cosmic ray. The supernova remnant IC 443, popularly known as the Jellyfish Nebula, is located 5,000 light-years away toward the constellation Gemini and is thought to be about 10,000 years old. W44 lies about 9,500 light-years away toward the constellation Aquila and is estimated to be 20,000 years old. Each is the expanding shock wave and debris formed when a massive star exploded. The Fermi discovery builds on a strong hint of neutral pion decay in W44 observed by the Italian Space Agency’s AGILE gamma ray observatory and published in late 2011. NASA’s Fermi Gamma-ray Space Telescope is an astrophysics and particle physics partnership. Goddard manages Fermi. The telescope was developed in collaboration with the U.S. Department of Energy, with contributions from academic institutions and partners in the United States France, Germany, Italy, Japan, and Sweden. Be the first to comment on "Supernova Remnants Accelerate Cosmic Rays"